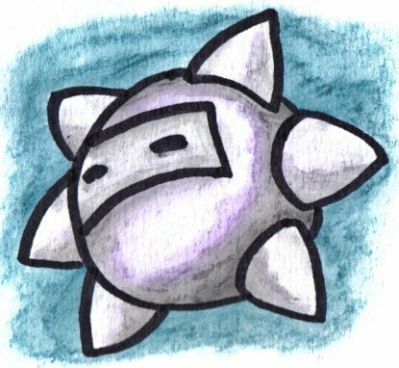 Just a simple picture of the six pronged Gordo who appears in Dream Land 3. It doesn't actually have a name, so I just stuck Japanese for six into the name. Roku. Gorudoo. So, Gorokoo. If you have any better ideas, I'd like to hear it (not really). Just more crummy water color pencils and permanent marker. All right, a spike-ed Waddle Dee! Umm, is he wearing suit? Sorry to bother you off-session. Great job tho'! Well, Captain Stitch, who is basically a giant Gordo, will launch his protective covering at you, revealing his weak body under neath. It wouldn't be too much of a stretch to call it a suit, but I think that is just his face. This guy looked like javelin knight to me. The simplicity is what makes things like this awesome, it helps to bring out the true spirit of the character.... gotta love it!